Europe faces a major challenge with the sustainability and quality of healthcare provision, as a consequence of demographic change, increased longevity and rising prevalence of chronic conditions 1 . Public expenditure on health and long-term care has been increasing over the last decades in all EU Member States, and is expected to rise even further. In 2015, it accounted for 8.5% of GDP in the EU and could reach up to 12.5% of GDP in 2060 2 . Despite increased spending in health and long-term care, and advances in medical science, those extra years of life gained through increased longevity are not necessarily spent in good health. Healthy life years indicate the amount of life spent in a healthy state, rather than the length of life, and are an important measure of the relative health and quality of life of populations. Between 2010 and 2014, there have been virtually no gains in healthy life years in many EU countries. This suggests that greater efforts may be needed to prevent illness and disability and to improve the management of chronic conditions to reduce their disabling effects 3 . The Commission Communication on effective, accessible and resilient health systems 4 concluded that Member States’ future ability to provide high quality care to all will depend on making health systems more resilient, more capable of coping with the challenges that lie ahead. And they must achieve this while remaining cost-effective and fiscally sustainable. These needs have been recognised by policy makers 5 , 6 . In particular, the Council Conclusions on the Economic Policy Committee - Commission Joint Report on health care and long-term care in the EU 7 identified a number of reform measures to address policy challenges in health and long-term care systems, including: strengthening health promotion and disease prevention; moving healthcare out of the hospital sector towards more cost-effective primary and ambulatory care services; and promoting integrated care. Innovative solutions that make use of digital technologies can, if designed purposefully and implemented in a cost-effective way, provide the means to support such reform measures in health and long-term care systems. eHealth, telemedicine and other digital technologies such as 4G/5G mobile communications, artificial intelligence and supercomputing offer new opportunities to transform healthcare systems 8 . They allow the capture, management and processing of large volumes of diverse data generated from multiple sources to create new knowledge. They enable new approaches to personalised medicine, accelerating scientific progress, early diagnosis and prevention of diseases and more effective treatments. Furthermore, digital tools can assist in addressing shortages in health and care staff in rural areas and certain specialties. They can also connect the various actors across the health and social care sectors, thus ensuring effective sharing of data and collaboration, in more effective care models. In addition, digital technologies can enable citizens to access information about health risk factors and well-being measures, and help them engage in healthy lifestyle behaviour and disease prevention. Finally, the analysis of digital health data and patient-reported data can lead to improved procedures, reduce inefficiencies, support outcome-oriented healthcare, promote the evidence-based assessment of innovative health technologies, as well as improve emergency preparedness and response to epidemics. EU policies have consistently emphasised the importance of digital solutions such as eHealth. The afore-mentioned Communication on effective, accessible and resilient health systems and the Annual Growth Survey 2016 9 stress how digital innovations can improve integration of care through up to date information channels and deliver more targeted, personalised, effective and efficient healthcare, reducing errors and length of hospitalisation. Furthermore, the Directive on patients’ rights in cross-border care 10 identifies specific areas where Member State co-operation in eHealth can bring significant added value to national health systems, such as in the cross-border exchange of patient summaries and use of ePrescriptions, and for clinical professionals through the European Reference Networks. Finally, making full use of the possibilities of digitalisation is one of the policy options identified in the Joint Report on Health Care and Long-Term Care Systems and Fiscal Sustainability. While the 2015 Digital Single Market Strategy for Europe (DSM) 11 did not focus specifically on digital health and care, there were several references to eHealth. These references mentioned the digital health sector as an example (amongst other sectors) where digital services could bring benefits to citizens and businesses. The Communication highlighted in particular the need to make progress on standardisation and interoperability of digital solutions in the health sector supporting health systems' reforms. In response to the Digital Single Market Strategy, work focused on the major identified areas, including those in the digitising industry and public services initiative of April 2016 (specifically in the ICT priority standardisation plan 12 and the eGovernment action plan 13 ). In May 2017 the Commission Communication on the mid-term review of the Digital Single Market 14 suggested to increase coordination efforts on the digital transformation of health and care in Europe, focusing on three priorities: (i) Citizens´ secure access to electronic health records and the possibility to share it across borders and the use of ePrescriptions, (ii) Supporting data infrastructure, to advance research, disease prevention and personalised health and care in key areas including rare, infectious and complex diseases (iii) Facilitating feedback and interaction between patients and healthcare providers, to support prevention and citizen empowerment as well as quality and patient-centred care, focussing on chronic diseases and on a better understanding of the outcomes of healthcare systems. Other areas of law or policy initiatives are directly relevant for the development of a Digital Single Market for health and care. They include the protection of personal data, interoperability and research and innovation funding. The General Data Protection Regulation (GDPR) 15 applicable from 25 May 2018 will provide a uniform set of rules for data protection across the EU. The GDPR has direct relevance for the digitalisation of health, and Article 9 (processing of special categories of personal data) defines particular provisions that apply to health data. The General Data Protection Regulation allows Member States to maintain or introduce further conditions, including limitations, with regard to the processing of genetic data, biometric data or data concerning health (Article 9.4). It is to be noted that Recital 53 of the General Data Protection Regulation states that this should not hamper the free flow of personal data within the Union when those conditions apply to cross-border processing of such data. After the adoption of the General Data Protection Regulation the Commission has established an expert group 16 with the mission to clarify how Member States' existing and future legislation will ensure effective and uniform application of the General Data Protection Regulation. Under the General Data Protection Regulation the drawing up of codes of conduct is to be encouraged to contribute to the proper application of the Regulation, taking account of the specific features of the various processing sectors. The Biobanking and BioMolecular resources Research Infrastructure - European Research Infrastructure Consortium (BBMRI-ERIC) 17 , the Commission-supported pan-European distributed research infrastructure, has launched a roadmap process for the preparation of a code of conduct for life sciences and health research 18 . This builds on the Code of Practice drafted by the projects funded by the Innovative Medicines Initiative (IMI). Cross-border interoperability and access to health data among Member States and between national healthcare systems are supported by different EU instruments that are currently implemented, such as the Directive 2011/24/EU on the application of patients’ rights in cross-border healthcare among Member States. The 2008 Commission Recommendation on cross-border interoperability of electronic health record systems 19 has been adopted as a follow-up to the eHealth Action Plan 20 which, in 2004, defined interoperability of electronic health records as one of the priorities for Member States. The Recommendation was intended to support the premise that connecting people, systems and services is vital for the provision of good healthcare in Europe insofar as it is necessary to enable the free flow of patients as well as digital health products and services, and hence may contribute significantly to the establishment and functioning of the internal market. A refined eHealth European Interoperability Framework (ReEIF) was adopted by the eHealth Network in November 2015. The ReEIF provides a common framework of terms and methodologies that aims to address eHealth interoperability issues and serve as a key instrument for the improvement of projects and solutions in the particular domain. Moreover, a new European Interoperability Framework (EIF) 21 was adopted on 23 March 2017 in the context of the implementation of the Interoperability Solutions for European Public Administrations (ISA²) programme (2016-2020). The new EIF is meant to be a generic interoperability framework that could be used for the alignment of existing, or the creation of new, domain-specific interoperability frameworks (DIFs) such as those that could be developed in the field of electronic health records and other digital health applications. However, the framework alone does not provide technical specifications. The EU provides targeted research and innovation funding under Horizon 2020 22 supporting the use of digital technologies in health and long-term care services and the implementation of the Digital Single Market strategy, including a roadmap for standardisation, harmonisation and interoperability supporting sustainable market development for the use of digital technologies in health and care services. Other actions relevant for future initiatives on the digital transformation of health and social care include the work pursued by the eHealth Network 23 and investment commitments in digital health and social care from national and regional authorities 24 working under the European Innovation Partnership on Active and Healthy Ageing (EIP on AHA). Member States' existing and future legislation regarding the processing of data that concerns health 25 may affect access to data across borders and the advancement of research and personalised medicine. The 2008 Commission Recommendation on cross-border interoperability of electronic health record systems and subsequent work carried out in the development of the European Interoperability Framework for eHealth (ReEIF) have so far been insufficient to deliver cross-border access to electronic health records by healthcare professionals 26 , 27 or to ensure that citizens have the technical means to access and manage their personal health data 28 . Despite the significant investments made in this area by the EU, Member States and regional authorities, the uptake of digital innovation for health and care remains slow and varies greatly amongst Member States and regions. Notwithstanding the considerable potential of digital technology to contribute to better health and care outcomes, and the cross-border dimension 29 of digital health products and services, the European Union is not a fully functioning single market for digital health and care solutions. Most citizens are unable to access their health data both within their own country as well as across borders, national initiatives to gather data to support personalised medicine remain fragmented (and small-scale) across Europe and digital solutions are successfully implemented in pilot settings but consistently fail to scale up. Below are some of the issues that effectively or potentially affect the realisation of a digital single market for health and care. Digital technologies (e.g. smartphones, tablets, wireless sensors, etc.) that can be employed in mobile health (mHealth) surveillance, prevention, and intervention efforts have become more affordable and easy to use. These solutions can help citizens and professionals address preventable risk factors associated with chronic diseases (e.g. unhealthy diet and physical inactivity). They can also support active and healthy ageing, and facilitate early detection of symptoms and timely treatment, thus reducing the need for more burdensome treatments later on. Digital solutions that empower citizens with access to their personal health data are central to support a shift in health and care provision. They allow the citizen to be actively engaged in prevention of chronic conditions 30 (active and healthy ageing), adherence to treatments and providing feedback on the quality of health and care. However, the citizens' ability to access their personal health data remains differentiated across and within Member States. It ranges from non-existent in some, partial in others, to full access in certain Member States. Often the personal data concerning the health of a given citizen is scattered across different local and national data repositories (e.g. hospital, primary care, others) 31 . -Nine countries 33 have implemented systems at a national level that provide patients with online access to their eHealth data for some time now. What patients can access can be quite narrow e.g. health information only (Hungary), patient summary only (Finland). -Seven countries stated that they had national level electronic health record projects that included patient access to electronic health record information in development. -Ten countries stated that they provide access to patients to their eHealth data through multiple regional, local or speciality systems. Of this group, nine countries described current projects to develop a national system with patient access functionality, and the Netherlands are preparing guidelines for the development of regional systems that provide patients access to electronic health record data. The three countries that selected ‘No electronic health record systems’ (Cyprus, Czech Republic, Ireland) are planning to provide patient access to eHealth data ‘within 2 years’, ‘within 4 years’, and ‘in 5 years or more’ respectively. Malta has an online portal for doctors and their patients that fulfils much of the functions of a national electronic health record in terms of patient access to electronic health record information, but is also planning a national project to begin within 2-4 years. Health system reforms aim at a shift from a hospital-centred system to more home and community-based, person-centred and integrated care structures. Portals 34 that provide citizens with access to their personal health data, are an important enabler of this shift. But these portals are far from being the norm across the EU. Whilst several Member States have launched initiatives to create national patient portals 35 these initiatives are not currently coordinated at EU level in a way that would encourage cross-border interoperability and secure cross-border access to electronic health records by authorised healthcare professionals. Over the last years there has been an extraordinary increase in the amount and quality of health data generated by new devices and technologies. At the same time, improvements in computing capacity and performance and the emergence of other digital technologies that allow large data storage and advanced data analytics make it possible to accelerate research and development of new treatments, as well as prevention and early diagnosis of diseases. It is widely shared among the stakeholders that access to varied data-sets located across different Member States remains difficult or inexistent, the data is subject to different taxonomies and standards and therefore scientific research invariably builds on relatively limited population cohorts 36 . Larger scale cannot be achieved without cross border secure access to data sets, a shared computing and storage capacity and an appropriate regulatory framework that allows for secure access to data-sets across borders. Without these, it is increasingly difficult for healthcare organisations to optimise the quality and efficiency of their services and for EU researchers to achieve the critical scientific breakthroughs needed to support early diagnosis of diseases, enable coordinated response to epidemics or accelerate therapy development cycles across Europe 37 . In this context, effective coordination among Member States regarding the potential use of new emerging solutions can play an important role, if implemented systematically across Europe as part of the national and EU-level data and computation infrastructures for personalised medicine. These solutions must comply with the General Data Protection Regulation and could build on trusted distributed data ledgers (such as blockchain) for giving access to personal health data. Conversely, the absence of coordinated actions, and fragmented approaches to cybersecurity solutions, could potentially make it increasingly difficult for health data to be pooled at EU level to support medical research and personalised medicine. Several stakeholders in the research community have raised concerns with the potential effects of lack of coordination amongst Member States in the development of their national laws in the area of health 40 and research that could result in the establishment of widely varying safeguards, conditions and applicable derogations and could negatively impact the establishment of the European Research Area 41 . Such developments could also undermine investments in initiatives such as the European Open Science Cloud, which will rely on secure cross-border flows of data. Stakeholders representing the research community and patients' organisations have called for effective cooperation mechanisms between Member States and a minimum set of security requirements to ensure an equivalent level of protection of personal data shared by patients for healthcare and research purposes across the European Union, and to facilitate cross-border healthcare and research 42 . Furthermore, experts in the scientific and medical research community particularly involved in cancer research have consistently underlined that the individual right to data protection should not harm the population's right to health and urged the Member States to ensure that the possibility to maintain or introduce further conditions regarding health data conferred upon them by the new Regulation would not only make cancer research possible, but also as effective as possible 43 . Secure information and communication technology (ICT) infrastructures and data networks are critical to support the free flow of health data across borders in a secure and trusted environment. Healthcare organisations, like other regulated industries, have increased efforts to maximise security measures to protect their own infrastructure and data networks. According to recent research, healthcare data security incidents ranked second for the services industry in 2016 44 . In addition to the General Data Protection Regulation, which introduces security requirements applicable also to healthcare organisations 45 , the European Commission is also working to assist Member States and healthcare organisations meet the requirements set out in the Directive on Security of Network and Information Systems 46 . Furthermore, the European Union Agency for Network and Information Security (ENISA) has acknowledged the significance of digital health networks as critical information infrastructures and has developed actions focusing on the security challenges and risks faced by the health sector in the Member States. Given that healthcare services have been recognised as a critical societal function, the Agency for Network and Information Security has analysed the degree to which various digital systems and infrastructures are critical for the secure provision of healthcare services and launched the eHealth Security experts group. In November 2016, the group provided an overview of recommendations to hospitals and healthcare organisations, comprising a combination of organisational and technical security measures to mitigate the risks resulting from cyber threats and corresponding vulnerabilities. Efforts to ensure coordination, monitoring and technical support provided to Member States in the implementation of technical and organisational security measures, are expected to continue as the Directive is transposed into national law. Citizens requiring medical care when traveling or moving residence to another EU Member State are often confronted with the lack of access to their own medical records or medication. Access is particularly crucial when citizens seek emergency treatment while travelling outside their Member State of origin or residence or when they might be obliged to repeat procedures because they cannot access or re-use information from procedures completed recently in another healthcare institution. The current lack of electronic health record exchange formats that can be readable across borders limits the access of citizens and healthcare professionals to critical medical information about an individual receiving care in another country. This has an impact on the quality of care provided to European citizens. In some cases, the limited access to personal health data across borders, could adversely affect the safety of patients because of errors in medication lists and adverse drug reactions that otherwise could have been identified and avoided in time 48 . The 2008 Commission Recommendation on cross-border interoperability of electronic health record systems and subsequent work carried out in the development of the European Interoperability Framework for eHealth (ReEIF) have so far not delivered cross-border access to electronic health records by healthcare professionals 49 or ensured that citizens have the technical means to access and manage their personal health data 50 . Beyond the lack of an established technical specification to support electronic health records that are readable across the EU, another major obstacle to implementation of interoperable cross-border access to electronic health records remains the extensive use of proprietary solutions and vendor lock-in models that increase both the cost and complexity of health information exchange efforts across the EU 51 . Vendor lock-in undermines interoperability of electronic health record systems amongst healthcare providers in the EU and prevents the electronic health records from being readable across borders by healthcare institutions and professionals 52 . It is not only citizens that feel the adverse effects resulting from the current lack of interoperability of electronic health record systems across-borders. The absence of a common, shared open format at EU level to support interoperability of electronic health record systems increases barriers to open innovation, undermining business opportunities for innovative SMEs and negatively impacting the process and costs of digitising health information. Additionally, the existing lack of interoperability of electronic health record systems across the EU does not appear to bring benefits to EU economic actors in general. Despite the positive growth forecasts for the global market of electronic health record systems, EU companies maintain a persistently modest market share 53 compared with their US counterparts, which have benefited from a domestic regulatory environment 54 based on standardised and certified electronic health record systems 55 . Furthermore, in the opinion of certain stakeholders, the current lack of interoperability of electronic health record systems across the EU significantly hinders the ability of the research community to access larger data-sets and make secondary use of health data, creating additional headwinds that limit progress in the fields of data-driven healthcare research, new health prevention strategies and personalised medicine. Currently, several Member States are progressing in implementing interoperable electronic health record systems within a national or regional level (figure 1). However, there is no co-ordinated solution or approach in place for a full-scale interoperability of electronic health records in a European context (figure 2). The landscape regarding the main levels of interoperability (legal, organisational, semantic and technical) remains fragmented and is widely considered to hinder effective cross-border flow of healthcare data 56 , 57 . The lack of interoperability among the electronic health record systems implemented within the Member States and the adoption of various, different standards constitute a major challenge leading to market fragmentation and to a lower quality level of cross-border healthcare provision 58 . Market analysis of the European electronic health record market, performed by Frost & Sullivan in 2015 59 , concluded that "the absence of a pan-European EHR strategy has worsened market fragmentation and continues to act as a barrier to electronic health record adoption". In this context, the absence of a pan-European electronic health record strategy was described as a major market restraint. World Health Organisation data indicates (see figure 2) that the current variety of national approaches regarding the use of standards for electronic health record implementation poses significant challenges to the development and implementation of effective electronic health record cross-border exchange. In the same study, funding, capacity, resources and infrastructure were also identified as very important barriers that hamper electronic health record implementation. Figure 3: Countries of the WHO European region with a national EHR system and legislation on it, by sub-region. France, Germany and Slovakia are not included in the EU-28 group (World Health Organization. From innovation to implementation: ehealth in the WHO European Region report. WHO Regional Office for Europe, 2016 60 ). There are also major disparities between EU Member States in the deployment of electronic health records as part of an interoperable infrastructure that allows different healthcare providers to access and update health data in order to ensure the continuity of care of the patient. The same can be said about the approach taken to regulate electronic health records – some EU Member States have set specific rules for electronic health records, others rely on general health records and data protection legislation. While some EU Member States have set detailed requirements as to the content of electronic health records, others do not specify what this content should be. The level of details of the legislation on electronic health record content varies greatly from a simple reference to health data in general to exhaustive and detailed list of categories or data items 61 . Regarding legal interoperability for cross-border electronic health record exchange in particular, few EU Member States have already established a relevant framework of legal provisions (figure 4). A reason behind the specific issue, according to the relevant study 62 , is that the competent authorities perceive cross-border transfer of electronic health records as a challenge "that should be dealt with at the EU level and did not want to develop cross-border systems (e.g. through regional and bilateral agreements) that could potentially be in contradiction with the future action of the EU". Figure 4: Countries regulating cross-border interoperability. Source: "Overview of the national laws on electronic health records in the EU Member States and their interaction with the provision of cross-border eHealth services report, July 2014". European citizens have the right to access their health data. This right is enshrined in the General Data Protection Regulation, which gives also European citizens the right to share their health data with parties they designate for a given purpose (for instance, for medical treatment or research). In a recent Eurobarometer study, approximately 52 % of respondents confirmed they wish to have online access to their health records (including health data, prescriptions and medical records) 63 . However, only a limited number of citizens are currently enjoying this privilege. Only 9% of hospitals in Europe allow citizens to access online their own medical records, and most of those only give partial access 64 . In 2008, Estonia became the first country in the world to implement a nationwide “birth-to-death” electronic health record system for nearly every citizen. However, since then only an additional 13 EU Member States have granted their citizens with some access to electronic health records 65 , with the Member States deployment of electronic health records being greatly varied (see Figure 1). The use of ePrescriptions across Europe is equally diverse, with only a minority of Member States having it widely available to their citizens 66 . The eHealth Action Plan, and more specifically the EU Cross Border Health Directive (2011/24/EU, Articles 11 and 14), include certain elements - namely electronic health records, electronic prescriptions (ePrescriptions) and telemedicine - that constitute crucial components to enable the emergence of innovative digital health and care solutions 67 . The eGovernment Action Plan also aims to support Member States in the development of cross-border eHealth services. The digitisation and exchange of electronic health records and ePrescriptions can enable better provision of health and care of services to citizens, including when travelling across different Member States. Additionally, available studies show that the adoption of electronic health records and ePrescriptions 68 across the EU could also generate efficiencies 69 , and therefore contribute to the attainment of fiscal sustainability goals for health and long-term care systems. The percentage of hospitals exchanging electronically clinical care information about patients remains low: up to just 39% of hospitals exchange care information with other healthcare providers in the same country; whereas only 4% of hospitals do this with healthcare providers in another EU country 70 . The percentage of general practitioners using electronic networks to exchange medical patient data with other healthcare providers and professionals varies greatly between Member States: from 91.8% of general practitioners in Denmark and 76.2% in the Netherlands to only 5.4% of general practitioners in Slovenia. 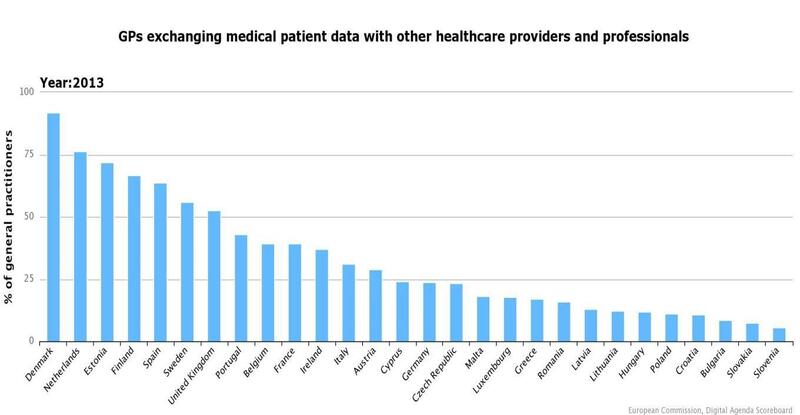 Even in countries with high levels of domestic exchange of patient data, the exchange with healthcare providers in other EU Member States remains low 71 . This is particularly relevant as the number of patients receiving treatment in another EU Member State continues to increase 72 . Regarding patient and healthcare professionals' identification, as well as access rights to electronic health records, there is also a significant variety of available systems and approaches across the EU Member States. 13 Member States make use of a health insurance number for patient identification in their national eHealth systems, while 14 Member States use an ID card number approach, and two Member States are using other solutions. As for the identification and authentication of health professionals (e-Signature/ smart card), 15 Member States have an identification and authentication method and 16 Member States currently have access rights differentiated per type of health professionals. It is worth highlighting that eleven Member States have both elements in place in relation to health professionals 73 . Figure 6: National legislation on the sharing of data, by sub-region (WHO European region). (World Health Organization. From innovation to implementation: ehealth in the WHO European Region report. WHO Regional Office for Europe, 2016) 74 . Cross-border exchange of health data is starting to take place, based on voluntary co-operation between the Member States. Under the telecommunications sector of the Connecting Europe Facility 75 eHealth call on Digital Service Infrastructure 76 for cross-border exchange of Patient data and ePrescription instigated active co-operation of Member States in these areas. Sixteen Member States obtained EUR 10.6 million of EU funding to be part of a secure peer-to-peer network allowing the exchange of Patient Summaries and/or ePrescriptions, as a first step towards seamless cross-border care and secure access to patient health information between European healthcare systems. The eHealth Digital Service Infrastructure aims to enable medical personnel to obtain life-saving information in unplanned care situations and reduce the repetition of diagnostic procedures. When a citizen makes an unplanned visit to a healthcare provider abroad, within the European Union, the eHealth Digital Infrastructure will allow the healthcare professional to have access to their Patient Summary. Furthermore, the ePrescription services will enable the patient to receive abroad the equivalent medication treatment that they would have received in their home country. A second call in 2017 allowed 6 more Member States to join this cross-border exchange of health data. In 2018, for the first time several Member States will start exchanging Patient Summaries and ePrescriptions across borders. The solutions used in the eHealth Digital Service Infrastructure build upon the achievements of pilot projects that successfully tested the exchange of personal health data between Member States and developed related open specifications and software, in particular the epSOS 77 project and the EXPAND 78 project; as well as the guidelines on Patient Summaries and ePrescriptions developed by the eHealth Network 79 . The European Interoperability Framework was a point of reference for these projects. Despite over a decade of Commission recommendations and voluntary cooperation in the definition of electronic health record standards, the market has so far not delivered electronic health record solutions that are interoperable across borders, mainly due to the prevalence of electronic health record systems based on closed proprietary solutions. It clearly undermines the full realisation of a digital single market for digital health and care solutions and disadvantages European companies, notably SMEs that are unable to compete with the established commercial vendors of closed proprietary electronic health record systems. ·Firstly, there are barriers to overcome at national level, such as the need to ensure interoperable connectivity among systems within the national level (e.g. among hospitals, general practitioners, primary care centres and pharmacies within each Member State). ·Furthermore, the cross-border exchange of health data sets wider than Patient Summaries and ePrescriptions asks for further interoperability issues to be resolved. This would in turn require taking intermediate steps (such as aiming for cross-border exchange of e.g. discharge letters and data related to chronic conditions) on the way to full electronic health record exchange, while, in parallel, configuring an exchange format for full electronic health records. ·Finally, mechanisms to sustain the voluntary co-operation between Member States would be required, which in turn calls for configuring sustainable governance and financing arrangements. The question of the long-term sustainability of the Digital Service Infrastructures beyond the Connection Europe Facility programme was assessed in the study "Long-Term Sustainability of Digital Service Infrastructures". The VALUeHEALTH project proposes an evidence-based business plan for sustainable interoperability, with sustainable revenue streams for developing and operating priority pan-European eHealth Services beyond 2020 80 . Ultimately though, the number of citizens who will have electronic access to and benefit from portability of their personal health data will depend on the level of deployment of interoperable eHealth solutions in national and regional health systems in Member States. Besides the well-recognised need to overcome interoperability issues, achieving wide deployment of electronic health records and ePrescriptions at national scale requires significant investments. More targeted use of EU funds by health authorities – such as the European Structural and Investment Funds and the European Fund for Strategic Investments 81 - can be instrumental in mobilising further investments from the public sector and private investors alike. The use of open standards and interfaces, such as OpenEHR 82 currently in use in some Member States, fosters semantic scalability, provides a vendor-neutral approach and supports flexible interoperability among the various electronic health record solutions implemented in the Member States. The building of open ICT systems based on the exploitation of standards has already been identified as a good practice that will increase competition, promote efficiency and support the development of innovative services that can be used by citizens or public authorities 83 . Some Member States have started to address the unsustainable costs of maintaining proprietary closed systems that cannot integrate with other data ecosystems 84 . The creation of an agreed exchange format (technical specification) at EU level - to ensure that data from electronic health records can be accessed cross-border and patients can provide access to their data concerning health to a doctor in another EU Member State (for example when consulting a specialist, receiving emergency treatment or providing access for secondary use in research) - could be achieved through EU-level cooperation in the development of technical specifications. Cross-border interoperability of electronic health record systems can allow citizens to receive care when travelling or living in another EU Member State, by providing access to their health data. According to stakeholders, interoperability of electronic health record systems will also positively impact EU SMEs and innovative companies 85 competing in the global digital health market, and provide new opportunities for the EU research community to access large scale data sets from electronic health records, often required for the development of new personalised treatments and medicines 86 . However, there are no inherent incentives for proprietary electronic health record systems developed and implemented at national or regional level to become interoperable. With the introduction and widespread adoption of a European Electronic Health Record (EEHR) exchange format, based on open technical specifications, citizens could be empowered to use their personal data concerning health across borders, share it with authorised healthcare professionals and make informed decisions about their health 88 . The EEHR exchange format will support the shift to a patient-centred or patient-driven healthcare provision model where the patient is empowered by data. Access to their personal data by patients could overcome the difficulties and obstacles deriving from the lack of cross-border electronic health record interoperability and according to Auffray et al. (2016) "provide a wide range of new health service business opportunities with major economic potential and unleash new ways to stimulate a competitive health-driven economy" 89 . Health and care practitioners would have quick access to a more comprehensive view of the patient’s medical background and history, regardless of their location in the EU, enabling them to reach a reliable and accurate diagnosis quicker than before, to reduce medical errors and to provide safer treatment outside the patient's country of residence, while simultaneously ensuring the protection of personal data and conﬁdentiality 90 . At EU level, there has been a wide recognition that the use of health data to advance research and develop personalised medicine 91 has the potential to offer significant benefits for patients and healthcare systems 92 . Over the past years, personalised medicine has gradually gained recognition as a useful tool for healthcare organisations across different disease areas. Physicians are increasingly welcoming therapies supported by data analytics which have the potential to replace trial-and-error with precision diagnosis and treatment, benefiting both the provider and recipient of health and care services. An estimated 70 % of citizens in the Union would be ready to share their personal health and wellbeing data (medical and care data, lifestyle, physical activity, nutrition, etc.) to support scientific research or improve treatment and early diagnosis of disease 93 . However, for the time being there is no secure, commonly accepted infrastructure at EU level to enable federated access to health data that can support personalised medicine across the EU. The absence of an agreed set of ontologies creates a high level of uncertainty around the quality of capturing and processing of health data. Lack of interoperability between data sources and limitations in data storage and computing capacity, as well as the different legal regimes set forth at national level to further specify the GDPR for the access and processing of health and health-related data across the EU, remain the major obstacles to effectively pooling data and resources at EU level and translating health data into better health and care outcomes. Over the past decade the volume of data generated from medical research and healthcare has grown exceptionally fast. The annual data generation is estimated to a 4300% annual growth between the period 2012 and 2020 94 . Big data in health encompasses high-volumes, high-diversity biological, clinical, environmental, and lifestyle information collected from single individuals to large cohorts, in relation to their health and wellness status, at one or several time points. The amount of data produced by sequencing, mapping, and analysing genomes is considerable. Each human genome has 6 billion ‘letters’ and when sequenced generates approximately 100 gigabytes of data. Therefore, analysing and storing genomes at scale rapidly runs into petabytes or even exabytes of data storage and performance requirements. When combining this with other applications (such as transcriptomics and metabolomics), technologies (such as imaging and patient monitoring) and with clinical, personal and environmental data, the requirements become considerable and require both advanced computing performance and significant storage capacity. A major challenge faced by healthcare authorities, practitioners and scientists is being able to bring this wealth of data together and interpret a genomic finding in the context of the individual patient. There is a need to share data, deriving the knowledge gained from data at a population level to sort through the ‘noise’ of variation in a person’s genome to identify the ‘signal’, an individual change or pattern that may be unique to an individual. The quality of conclusions on the aetiology of diseases follows a law of large numbers. Cross-sectional cohort studies of 30,000 to 50,000 or more cases are required to separate the signal from noise and to detect genomic regions associated with a given trait in which disease-related genes or susceptibility factors are located 95 96 . Even some of the largest national programmes to aggregate -omics 97 data, such as the UK Government-funded 100,000 genomes project, or France’s Médecine Génomique 2025 which will establish capabilities for sequencing over 200,000 genomes a year, will have a limited number of individuals that share the same genetic mutation and indeed often relatively few patients with a specific condition, particularly for rare disorders 98 . Another challenge lies in the pooling of different data-sets from a wide range of sources, including human (e.g. community, hospital or laboratory health services) and animal health surveillance, health registries, microbial and viral genomic data, pathogen resistance data, mapping of vectors, climate and environmental data, as well societal data that are correlates of disease. Linking these datasets for extended data mining purposes can open up possibilities for improved early warning and detection of infectious disease health threats, bolster the tracking and control of infectious diseases outbreaks, and enable rapid and personalised treatment of infected patients. The scientific and research community is increasingly engaged in a debate about the merits and advantages of creating a sustainable and effective ecosystem that brings together cross-border access to data-sets, computing capacity to analyse and process that data, knowledge and scientific expertise needed to accelerate the translation of big data into real outcomes for citizens and healthcare systems across the EU 99 . The EU has invested over EUR 2.6 billion in personalised medicine research and innovation in Horizon 2020 and its predecessor Framework Programme 7 100 . High-performance computing involves thousands of processors working in parallel to analyse billions of pieces of data in real time. High-performance computing allows to design and test new medicines, simulate their effects, and provide faster diagnosis, better treatments and personalised healthcare. Currently, EU industry provides approximately 5% of high-performance computing resources worldwide, but consumes one third of them. In April 2016 in the European Cloud Initiative – part of the EU's strategy to digitise European industry – the Commission urged Member States to step up cooperation in high-performance computing to boost Europe's scientific capabilities and industrial competitiveness. It also committed to develop a high-performance computing ecosystem based on European technology, including low power chips. Several Member States agreed in March 2017 101 to work together with the European Commission to support the next generation of computing and data infrastructures, within the framework of a European project. The plan is to establish the European High-Performance Computing Joint Undertaking 102 for acquiring and deploying an integrated world-class high-performance computing infrastructure capable of at least 1018 calculations per second (so-called exascale computers). This will be available across the EU for scientific communities, industry and the public sector, no matter where the users are located. The European High-Performance Computing Joint Undertaking initiative builds on existing cooperation initiatives among Member States, industry and science stakeholders such as the Partnership for advanced computing in Europe (PRACE 103 ), the European technology platform for High Performance Computing (ETP4HPC 104 ) and the pan-European data network for the research and education community linking national research and education networks across Europe (GÉANT 105 ). The European Commission proposed the new legal instrument European High-Performance Computing Joint Undertaking with a view to have the HPC initiative operational by 2019 106 . Advanced high-performance infrastructure and services will then be available to industry and SMEs, as well as the public sector among others. This will also support the European Open Science Cloud 107 and allow millions in the research community to share and analyse data in a trusted environment across technologies, disciplines and borders. The European Open Science Cloud 108 aims to give Europe a global lead in scientific data infrastructures, to ensure that European scientists reap the full benefits of data-driven science. Practically, it is expected to offer 1.7 million European researchers and 70 million professionals in science and technology a virtual environment with free at the point of use, open and seamless services for storage, management, analysis and re-use of research data, across borders and scientific disciplines. The results of the consultation with stakeholders and Member States show that its development should be driven by the scientific community, who are the most advanced users and the largest producers of science in the world. It also shows that the European Open Science Cloud should be also open for education and training purposes in higher education and, over time, to government and business users as the technologies developed will be promoted for wider application. As announced in the Commission’s Communication of 19 April 2016 109 , Horizon 2020 would be used to integrate and consolidate e-infrastructure platforms, to federate existing research infrastructures and scientific clouds and to support the development of cloud-based services for Open Science. This will make access to scientific data easier, cheaper and more efficient. It will enable the creation of new market opportunities and new solutions in key areas such as health, environment, or transport. The European Open Science Cloud will provide a secure environment where privacy and data protection must be guaranteed by design, based on recognised standards, and where users can be confident concerning data security and liability risks. It is envisaged that the establishment of the European High-Performance Computing Joint Undertaking Joint Undertaking and the European Open Science Cloud will provide a solid basis for the enhancement and further development of personalised medicine in Europe. This will however rely on access to health data-sets and integration with European scientific and knowledge networks in the respective fields of application. Genome sequencing and analysis are complex tasks that demand powerful analytics platforms. The time needed for sequencing has been reduced considerably in recent years, making it possible to drastically increase the amount of genomic data collected on large study populations. This opens the way to new omics- based improvement of healthcare services, leveraging in depth and comprehensive genomic analyses for a predictive and personalised medicine that can achieve better and predictive diagnosis, more efficient treatments and customised therapies. To achieve this, sequence analysis must be available on a large-scale, and complex analytics must be supported by adequate computing technology. This requires computational power and data storage capabilities on an unprecedented scale. Cooperation within the Union can help achieve this scale. For example, by joining medical research, data-sets and high-performance computing, there are major new opportunities for personalised and optimised treatment options for cancer based on analysis of genetics and other data sources. In a typical cancer study today, more than eight million measurements are taken from the biopsy of a single tumour. But as current technologies allow researchers to characterise the biological components of cancer with greater levels of accuracy, the substantial amounts of data generated by these technologies have out-paced the ability to quickly and accurately analyse them. To tackle these complicated and consequential personalised medicine problems, researchers globally are looking towards the promise of exascale computing combined with advanced data analytics, modelling and simulation on the basis of very large data-sets. This has the promise to detect risks much earlier and to develop precise options for personalised interventions. Omics data are central to advance personalised medicine and progress in genomic sequencing has produced a fundamental change in clinical and translational research over the past decade, leading to improved success in discovery and development of new treatments and diagnosis of disease 110 . Development of major initiatives in genomics and personalised medicine is a global trend with significant investments being committed, for example by the governments of the United States (1 million genomes and EUR 3.8 billion planned investment) and China (100 million genomes and EUR 7.9 billion planned investment). In Europe the most comprehensive initiatives, encompassing clinical implementation, research and enterprise, are being seen in Member States such as the UK (100,000 Genomes Project) and France (Médecine Génomique 2025). There has also been significant long-term investments and strategies relating to genomics, with skills and infrastructure developed in countries such as Estonia, Denmark, Iceland, and Finland; and others leading in the clinical application of genomics, such as the Netherlands 111 . Major genomics programmes provide a basis for a more personalised medicine leading to more efficient healthcare systems and stimulating economic returns 112 . Sequencing and analysis of 100,000 genomes to inform the diagnosis of patients with cancer and rare diseases. 4.Kick-start the development of a UK genomics industry. The project was proposed as being of huge cultural value and leading in this area in global research. It is has collected over 50,000 samples (5% of adult population) and links this to clinical and survey data to form a rich data set. 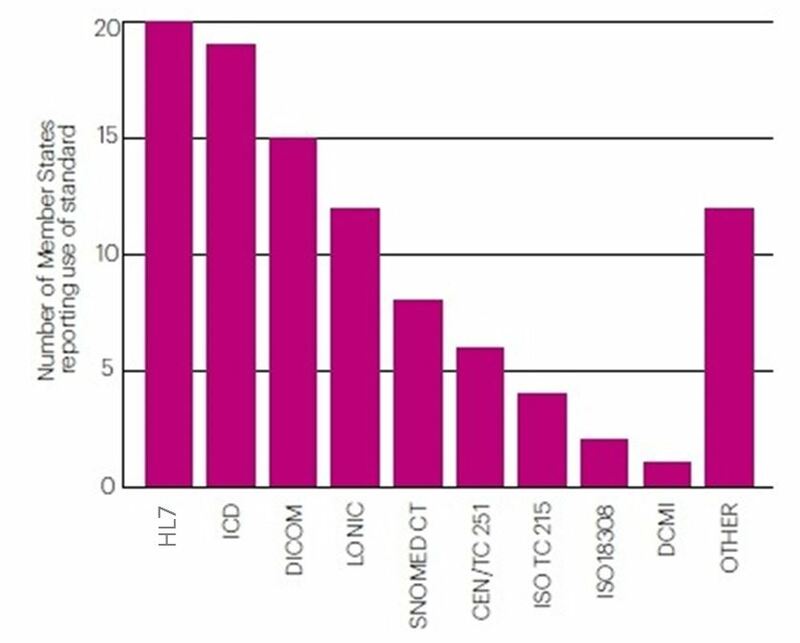 Genotyping analysis has been performed on these samples, along with sequencing in a proportion, along with additional samples and investigations in many. There are ambitions to grow it further to cover a significant percentage of the population and embed genomics within the health system as part of clinical decision support. It has gathered significant awareness and support across a large proportion of the population. 3.To be capable by 2020 of sequencing 235,000 genomes a year for rare diseases and cancer, with growth beyond 2020 to cover common diseases. 4.Targeted interventions through the use of companion diagnostics to identify and stratify effective treatments. Strategic funding for research in personalised medicine. Targeted across R&D from biomarker validation through to therapies and service implementation. Main goal is for patients to benefit more quickly. Ethical, legal and economic challenges and engagement and information platforms are also included within this. The Chinese government confirmed plans to make precision medicine part of its Five Year Plan for 2016-2020 as it works to prioritise genomics to drive better healthcare outcomes. 7.Create a platform to enable trials of targeted therapies. The Commission has contributed to several large scale international initiatives aiming at collecting harmonised and standardised omics data for research purposes. This includes the International Human Epigenome Consortium (IHEC) 114 which coordinates the production of reference maps of human epigenomes for key cellular states relevant for health and disease. Common bioinformatics standards, data models and analytical tools are used to organise, integrate and display whole epigenomic data for use by the research community. The EU contributed EUR 30 million to the BLUEPRINT 115 project which delivered more than 100 reference epigenomes relevant for diseases of the haematopoietic system to the IHEC Data Portal. The EU has also contributed to the mapping of cancers through the International Cancer Genome Consortium (ICGC) 116 . The ICGC Data portal include comprehensive description of genomic, transcriptomic and epigenomic changes in 50 different tumour types and/or subtypes which are of clinical and societal importance across the globe. These and other initiatives are also interacting with the Global Alliance for Genomics and health (GA4GH) 117 which aims to contribute to the policy-framing and technical standards-setting to enable responsible genomic data sharing. Further efforts in the area of mapping the microbiome, and to establish an atlas of all human cells are important next steps towards the better understanding of human health and disease. Under the leadership of the European Commission several initiatives related to personalised medicine have come together and in November 2016 the International Consortium for Personalised Medicine (IC PerMed) was launched. IC PerMed 118 is a Member States led initiative which brings together research funders and policy-making organisations from 28 countries to coordinate research and health policy to advance the implementation of personalised medicine. A first action plan has been released in March 2017, in which 8 of 22 research actions concern research on standardising and sharing of data 119 . Several areas of application already gather the scientific expertise and the basic semantic frameworks to support data exchange and data-sets that can allow for significance in findings and development of new solutions. Around 30 million EU citizens are affected by an estimated 5000 to 8000 life-threatening or chronically debilitating rare and complex diseases. Patients with rare diseases often spend years waiting for the correct diagnosis 120 and most rare diseases lack efficient therapy and cure. With small and dispersed patient populations in each country, advanced clinical and scientific expertise on rare diseases is fragmented, scarce and scattered in different laboratories and knowledge centres throughout the EU. This scarcity of expertise translates into poor access to specialised care for those suffering from rare diseases, delayed diagnosis, and fewer products and therapies as research and development investment in medicinal products for rare disease treatments is low. The EU invested over EUR 1 billion for rare diseases research in Horizon 2020 and its predecessor Framework Programme 7 121 . Set up under the Directive on Patient Rights in Cross-Border Healthcare, the 24 European Reference Networks on rare, low prevalence complex diseases are virtual networks from 25 European countries including Norway bringing together more than 900 healthcare units in over 300 hospitals across Europe to tackle rare or complex diseases and conditions that require highly specialised healthcare and a concentration of knowledge and resources. Connected through a dedicated IT platform financed by the telecommunications sector of the Connecting Europe Facility, the European Reference Network can convene a "virtual" advisory board of medical specialists across different disciplines to review the patient's case for diagnosis and treatment. The European Reference Networks will give healthcare providers access to a much larger pool of expertise and knowledge, increasing the chances of patients suffering from such conditions and diseases to receive the best advice to treat and diagnose their condition. The European Reference Networks will serve as research and knowledge centres stimulating new innovative treatments and therapies for patients across the EU and the development of eHealth tools to enhance access to care. The development of a data infrastructure would enhance the potential use of the European Reference Network patient data, with patient consent, for research, new therapies and better care outcomes. Pooling data and computing capacity from different countries is the only way to achieve a sufficient sample size for epidemiological and/or clinical research, to improve the understanding of the natural history of rare diseases and of the patient phenotypes, necessary to make progress in the diagnosis and treatment of rare diseases. Cooperation within the Union and between Member States and EU funded actions in the field of rare diseases allow to pool resources, knowledge and expertise. RD-Connect 122 has developed an integrated platform connecting databases, registries, biobanks and clinical bioinformatics for rare disease research in which complete clinical profiles are combined with –omics data. The platform accepts data from other projects funded nationally, at EU or international level. RD-Connect collaborates closely with two other EU-funded projects EuRenomics 123 and Neuromics 124 focussing on the molecular characterisation of a large group of rare diseases using “-omics” technologies. Their work has helped understand disease mechanisms and opened avenues for new diagnostic tools and therapies. Standardised formats are used for the description of the diseases and their detailed phenotypic characteristics based on the Orphanet Rare Disease Ontology (ORDO) and the Human Phenotype Ontology (HPO) promoted by the International Rare Diseases Research Consortium (IRDiRC 125 ). The current work programme of Horizon 2020 includes a topic for Rare Disease European Joint Programme Cofund which aims to create a research and innovation pipeline "from bench to bedside" ensuring rapid translation of research results into clinical applications and uptake in healthcare for the benefit of patients 126 . EU contribution of EUR 50-55 million is reserved for the topic. There is no established digital infrastructure to support cross border access to relevant health data for research. For example, while the recently established European Reference Networks (ERNs) on rare, low prevalence complex diseases are breaking new ground in cross-border healthcare, the lack of a European digital infrastructure leads to a high level of fragmentation in terms of rare disease data-bases and patient registries, and the same applies to other fields. Common data structures, coding systems, terminologies and standards are crucial for the semantic interoperability and comparability of rare disease data. The Orphanet nomenclature 127 improves the interoperability of rare disease systems and, by harmonising rare disease codification, adds value to the re-usability of data for research. The EU funded Orphanet, the largest global repository of rare disease information and therapies, is key to maintaining the interoperability tools Orphacode and ORDO ontology. Its further development is fundamental for rare disease diagnosis, treatment and research. To overcome the fragmentation of rare disease patient data contained in over 600 patient registries across Europe, the European Platform for Rare Diseases registration (EU RD Platform) provides EU standards and recommendations for rare disease data collection and sharing. In October 2017, the EU RD Platform defined a "Set of Common Data Elements for Rare Diseases Registration". Improving the interoperability of patient registries enables the critical mass of data necessary for epidemiological, clinical, translational, pharmacological and other studies and research at European level, thus supporting knowledge generation on rare diseases and helping to improve diagnosis, treatment and care for rare disease patients. Next generation genome sequencing and analysis, as well as mining of pooled Big Data, can improve the anticipation of epidemics and accelerate EU-wide identification of infectious threats (within days), thus allowing swift response to infectious outbreaks. These tools are made possible by novel IT infrastructure (high-performance computing, high-speed internet transfer) and advanced IT technologies which are needed to rapidly process, transfer, store and compare the relevant data and meta-data. Worldwide, infectious diseases are responsible for around 20% of all deaths 128 . Increasing global travel and trade enhance the potential for infectious diseases to spread. At the same time, the evolution of viruses and bacteria means that there is a constant risk that new diseases may emerge as well as different more virulent forms of existing diseases may emerge. When they are not contained these diseases can have devastating human, social and economic impact, as was demonstrated by the 2014-2015 Ebola epidemic and the 2009 influenza pandemic. - integration of surveillance data with real-time information e.g. vaccination coverage, data from health registries, hospitals and laboratories, and societal data from informal/non-traditional sources like social media or health apps in order to map the evolution and guide management of the epidemic. Science to support better preparedness and response capacities for infectious disease threats is a rapidly developing field increasingly based on digital tools. So far under Horizon 2020, at least EUR 456 million has been committed to relevant preparedness research for infectious diseases 129 . The Horizon 2020 project COMPARE 130 , addresses the challenges and the opportunities linked to these advances, as a large-scale pilot. With a budget of almost EUR 21 million, COMPARE brings together key national reference laboratories from 10 EU countries. The project is developing a globally linked data and information sharing platform that uses advanced IT technologies to generate genomic data of infectious pathogens and integrate these data with other relevant (clinical, epidemiological, demographic, environmental etc.) data. It aims to facilitate rapid identification of emerging infectious threats in human health, animal health and food safety. Similar application of high-performance computing on genomics were also used during the Ebola outbreak, by the EU-funded project EVIDENT 131 , which researched the mutational rate of the Ebola virus during the West African epidemic and performed real-time molecular epidemiology based on sequencing in the field. Projects like COMPARE and EVIDENT provide insight on how supercomputing capacity and artificial intelligence, bringing together large data sets from different sources and disciplines, can improve the understanding of epidemics, and accelerate EU-wide identification of infectious threats. Advanced IT technologies can also support the development of new risk models to predict the possibility and trajectory of potential future outbreaks, by facilitating the integration and comparative analysis of inputs from various data sources, e.g. from human and animal health data, vaccination coverage, vector surveillance, laboratory data, environmental data, population density, travel, etc. EU research funds have already supported the development of such models for vector-borne diseases in general (cf. EDENext project 132 ) as well as disease-specific models e.g. for Dengue (cf. DENGUETOOLS project 133 ) and Zika (cf. the ongoing ZikaPLAN 134 and ZIKAlliance 135 projects). From a very different perspective, the TELL ME 136 project used social simulation models to understand the complex relationships between communication, personal protective behaviour and the spread of an (influenza) outbreak. The abovementioned projects illustrate the potential of advanced IT technologies for improved preparedness, early detection and response of infectious disease threats. The challenge now is to make sure that these piloted applications are expanded towards a common and large-scale use across the EU. Allowing for a swift response to infectious outbreaks, such technologies can support the reduction of outbreak-associated human, health system, and socioeconomic impact, and contribute to an increased protection of European citizens. Big data in health may come from a variety of sources including social media, physical activity trackers, electronic health records, insurance claim databases, patient registries, health surveys and observational studies, provided that the requirements of the GDPR are complied with. Real world data is big data, but the term specifically refers to any type of data not collected in a randomised clinical trial. This data can complement randomised clinical trial data to fill the knowledge gap between clinical trials and clinical practice, provide new insights into disease patterns and help improve the safety and effectiveness of health interventions. Patients selected for randomised clinical trials often have characteristics, experiences, and treatment protocols that differ from patients in daily practice and therefore it may not be possible to generalise the information gained in randomised clinical trials to a broader group of patients. There can also be a large uncertainty on the health gain obtained with a new product based on randomised clinical trial findings due to possible differences in the way patients and healthcare providers are going to use the product in real life. Randomised clinical trials may also be particularly difficult to conduct for some health interventions when the size of the population to be treated is small. This applies in the case of orphan products and may apply to personalised medicines. Moreover, due to the typically short follow-up of randomised clinical trials, long-term health outcome cannot always be captured. Cost-effectiveness analyses are thus often based on predicted outcomes relying on intermediate or surrogate outcomes. Real world data is increasingly used for regulatory purposes and Health Technology Assessment. The objective is to provide (early) access to innovative health interventions while ensuring safety and efficacy. After authorisation, real world data can contribute in the health technology assessment process by better predicting the effectiveness of the new treatment in daily practice or to serve as input in payment model such as outcome-based managed entry agreement. In such cases, price and reimbursement conditions that have been agreed on at launch can be reviewed over time, comparing real world data with initial predicted health outcomes. However, despite technological advances in big data mining and analytics, there are a number of issues that prevent the wider use of real world data. In particular, generating, collecting, storing and exploiting such real world data poses methodological and legal challenges regarding the further processing of data as there is no widely accepted regulatory guidance. In this context, Regulatory Science can enhance the scientific basis of the regulatory process, by integrating data from relevant sources outlined above. These include Electronic Health Record information, Real Word Data and other healthcare parameters. It offers an incentive to accelerate understanding of the spectrum of action of potentially new healthcare products in ways pertinent to the personalisation of healthcare. Increasing the use of real world data is being addressed through a variety of EU initiatives in the fields of research, regulation of medical products, therapies and health technology assessment. The Joint European Medicines Agency and Head of Medicines Agencies (EMA/HMA) Task Force on Big Data is exploring how medicine regulators can use real world data to support research, innovation and medicines development for the benefit of human and animal health. The Joint Action European Network for Health Technology Assessment 137 is producing evidence generation, with a focus on patient registries and, looking to the future, the European Commission plans to strengthen EU cooperation on health technology assessment post 2020, including issues related to real world data generation and use. In the area of transplant medicine, the Commission, national competent authorities and professionals are exploring how real world data could be integrated into regulatory oversight. ·The European Medical Information Framework project (EMIF-AD & EMIF-Metabolic) aims to federate heterogeneous sources of real world data to help researchers understand how treatments work when applied in clinical practice environments and provide new insights into disease patterns. Methodology and tools developed in these projects can be used to improve both medical product safety and effectiveness by targeting subgroups of patients who stand to benefit the most. ·In the area of product development (in view of regulatory process), the Electronic Health Record for Clinical Research (EHR4CR) aims to facilitate clinical trial design and patient recruitment which in turn allows to shorten clinical trial phase and accelerate access for patients to new treatments, targeting patient population, lowering clinical trial costs. ·To support the Health Technology Assessment (HTA) process, the GET REAL 138 project aims to provide methods and tools to better assess the effectiveness of the new treatment in daily practice (e.g. methods to combine randomised clinical trial data and real world data). In addition, two H2020 projects (IMPACT-HTA and COMED) that started in January 2018, investigate the same issue. ·To support the regulatory process, the development, authorisation and vigilance of (novel) transplant and transfusion therapies, the GAPP Joint Action (facilitating the authorisation and preparation process for blood, tissues and cells) is engaging 27 regulatory authorities and professional associations to provide a stronger evidence basis through the use of clinical real world data by regulatory authorities. In addition to these initiatives on real world data, several EU-funded projects working on big-data (including MIDAS 139 , BigO 140 , IASIS 141 , PULSE 142 , CrowdHEALTH 143 , EVOTION 144 ) focus on how to better acquire, manage, share, model, process and exploit data to develop integrated solutions that support public health authorities in healthcare system management, long-term policy making and increase the ability to provide actionable insights at the point of care. Bigmedylitics, a large scale pilot of EUR 17 million (EUR 15 million of EU funding) was launched in January 2017 to deliver a big data healthcare analytics platform and components, enabling data integration to support healthcare innovation. It involves 12 large scale pilots in different fields of application. It is widely acknowledged that not one Member State alone will be able to develop the expertise, data capacity and infrastructure needed to accelerate diagnosis, personalised treatment and prevention of diseases, particularly if compared with major emerging initiatives on personalised medicine such as those being pursued in the United States and China. EU actions to support coordinating national and regional initiatives in personalised medicine and genomics, and the establishment of a digital infrastructure with associated technical agreements to allow sharing of expertise and distributed access to health data sets stored in different locations across the EU, could help the EU Member States remain competitive in providing the Union's population with the most advanced medical and care solutions. This could also allow them to explore the potential of innovation to support the future sustainability and resilience of healthcare systems. If the Union can achieve the scale to match other investments in the global race for personalised medicine, European companies may be better positioned to capture investment and explore personalised medicine solutions, allowing EU citizens access to innovative and personalised therapies. It is equally important to explore synergies between the EU and Member States research and innovation actions, particularly defining together the areas of future pilots that can exploit the potential of genomic data at the EU-level. Cooperation with health professionals will also be a key element for the success of data driven innovations in healthcare and for taking advantage of the new opportunities arising from big data, such as interpretation of information for genetic assessment to improve diagnosis and treatment. Faster scientific advances can be achieved through pooling resources at EU-level. Pooling resources in a decentralised / distributed model that provides cross-border access to expertise, data and computing capacity (without centralising these resources) can accelerate research in areas such as genetics, cancer treatment or infectious diseases outbreaks and is only possible through EU cooperation encompassing a network of multiple public authorities and research organisations across the EU. Maximising the use of real world data can fill knowledge gaps between clinical trials and clinical practice; however more efforts are necessary to engage and guide stakeholders, in particular clinicians, into the sharing of such data. Faster diagnosis and more personalised treatment of rare genetic diseases can be achieved if scientific expertise and data are pooled across borders, significantly reducing the estimated 5.6 years on average that it takes to diagnose a rare disease in Europe. With high performance computing, infectious diseases can be identified earlier, preventing outbreaks across the EU. Access to larger volumes of health data pooled securely across borders maximising the potential of Exascale high performance computing could vastly improve and accelerate development of new therapies. Freedom of movement requires EU-wide coordination is necessary for an effective and sustainable response to infectious threats across the Union territory. The EU is ideally placed to support the protection of EU citizens and Member States from major public health threats, by helping to prevent health threats spreading and providing rapid responses when a threat emerges - but also helping to ensure that there is a robust data and computing capacity to anticipate epidemics. Personalised treatments for complex diseases like cancer require the ability to process very large amounts of data, while applying methods of interpreting data and extracting new knowledge such as computer modelling, machine learning or artificial intelligence. 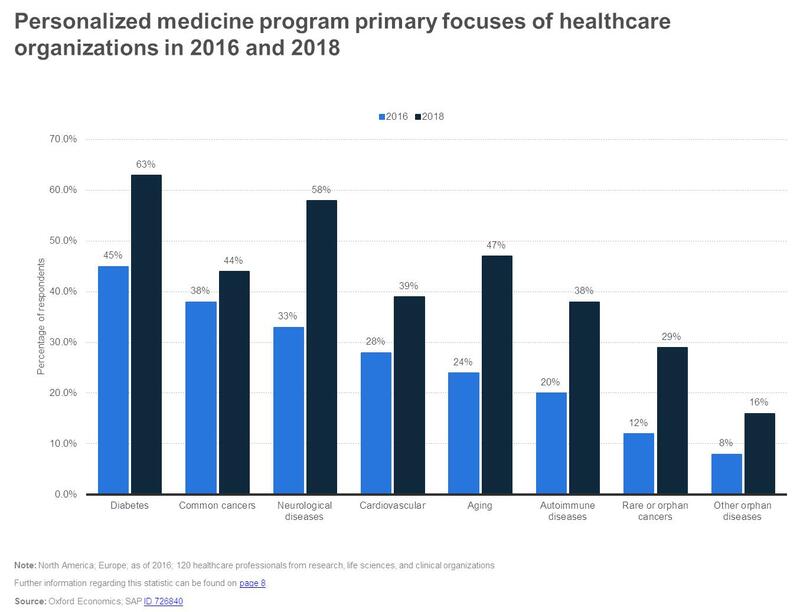 Personalisation of health requires interconnection of data sources (patient, hospital, bio-banks), biological levels (molecular, genetic, imaging, behavioural), and disciplines (medicine, pharmacology, social sciences and humanities). A convergent effort to build a whole new framework focused more on big data is needed, able to understand the molecular interactions and to support diagnostic image processing and running of predictive models, in order to diagnose much earlier and to select the best therapeutic strategies. This framework needs to be based on advanced computing and clever algorithms. While clinical applications may need a combination of multiple computational strategies adapted to the heterogeneity of data and careful protection of sensitive data, simulations in research (that can complement the testing of biomedical products and other experimental results) process and also generate new data likely to require exascale computing. Covering gaps for both health and research data infrastructures will significantly improve the understanding of cancer and, consequently, the impact of cancer treatments. European and Member States research is supported today by multiple initiatives that continuously generate data. A few platforms/repositories for medical data and computer-models storing/sharing and for clinical workflows simulations exist. Based on the use of high-performance computing and cloud infrastructures, they show how dedicated health data infrastructures can advance research and personalised medicine in medical applications like brain aneurysm, leukaemia and solid cancers. The mapping and connecting of these initiatives using cloud and high-performance computing data infrastructures will already mean a first step for progress. EU coordination and support to federate these e-infrastructures and further connections with Euro-HPC and EOSC services will contribute to build a common data infrastructure effective in managing the health-related big data and preparing the ground for a predictive, preventive, personalised and safe medicine. The establishment of a shared data and computation infrastructure, as well as pooling of scientific and medical expertise, is critical for Europe to benefit from the power of big data and analytics to offer citizens early diagnosis of diseases and new personalised treatments. This would lead to faster diagnosis of rare diseases (this will need cross-border data brought together), would allow for faster identification of and response to infectious diseases and would also allow for the development of personalised medicine. A European data and computation infrastructure could support access to large volumes of health-related data across borders based on which prevention, diagnosis and therapy development could be improved. Possible national laws further specifying the General Data Protection Regulation in specific areas must not undermine the objective of the free flow of personal data in the Union (see recital 53 of the General data Protection Regulation). If that were to happen, major barriers could be created for achieving the required critical mass of data to succeed in providing personalised medicine solutions for European health systems and citizens. In this context, new emerging cybersecurity solutions building on trusted distributed data ledgers for protecting the access to personal health data such as blockchain could play an essential role if implemented systematically across Europe as part of the national and EU level data and computation infrastructures for personalised medicine. The "Health at a Glance: Europe 2016" report 145 revealed that across the EU deaths from major non-communicable diseases translate into around 3.4 million potentially productive life years lost, or EUR 115 billion in potential economic loss each year for the EU economies. Moreover, large health inequalities persist in EU Member States between people with higher levels of education and income and the more disadvantaged, largely due to different exposure to health risks, but also to disparities in health behaviour and access to high quality care. In addition to suffering and premature deaths, non-communicable diseases account for the vast bulk of the money spent by health and social systems. Up to 7% of GDP is unnecessarily lost due to the impact of non-communicable diseases that are, to a large extent, preventable. Many non-communicable diseases share the same behavioural risk factors: tobacco use, alcohol consumption, unhealthy diet, physical inactivity. According to recent estimations, more than 30% of the overall disease burden in the EU can be attributed to such risk factors 146 . Prevention of disease and promotion of healthy living are recognised as essential principles for reducing the health burden related to both communicable and non-communicable diseases, requiring cooperation across borders and coordination within the EU 147 . Investing in health promotion and disease prevention can be cost-effective 148 , yet EU Member States allocate only around 3% on average of their health budget to public health and prevention, according to "Health at a Glance: Europe 2016". Importantly, prevention comprises promotion of healthy lifestyles (individual lifestyle choices such as not smoking, eating healthy, avoiding alcohol and exercising more) underpinned by policy choices that help create school, work and community environments conducive to leading healthy lifestyles. The need to shift the focus from sickness and cure to promoting health and disease prevention, including combating health inequalities, is well recognised at national and EU level 149 . It has been highlighted in the Joint Report on Health Care and Long-Term Care Systems and Fiscal Sustainability 150 , as one of the recommended policy options to enhance the fiscal sustainability and cost-effectiveness of health systems. To face the challenges which non-communicable diseases pose to health systems, Member States have committed to reaching the voluntary targets of the United Nations/World Health Organisation on non-communicable diseases by 2025 151 . The European Commission is committed to support Member States in reaching these goals which go hand in hand with Sustainable Development Goal 3 related to healthy lives and well-being for all at all ages, notably Goal 3.4 concerning non-communicable diseases, including mental health. The Member State Steering Group on Health Promotion and Prevention and Management of Non-Communicable Diseases provides strategic advice to the Commission and is a forum for consultation among Member States on the strategic planning in this area of health including the selection of best practices for transfer and scale-up within and across countries. This work is complemented by pertinent pan-EU collaborative actions, such as the joint actions on non-communicable diseases and healthy ageing "CHRODIS" (2013-2017) and "CHRODIS PLUS" (2017-2020) co-funded by the 3rd Health Programme. The ageing of the population and rising prevalence of chronic conditions are increasing the demand for health and social care. This, combined with workforce shortages, is putting the standards of care and the sustainability of health and social care systems at risk. Member States and regional authorities are looking for innovative approaches to address these challenges and have been embarking on reforms of their health and long-term care systems, with the goal of achieving sustainable, effective and accessible care for all. These reforms aim at shifting care from hospital to primary, community and home settings, adopting person-centred approaches that integrate care 152 , 153 across the continuum of health and social care 154 . In such reformed care models, the citizens, their families and informal caregivers have a significant role in the provision of healthcare together with care authorities. Firstly, an important element in person-centred care is that citizens become more involved in their care and engage in self-management of their well-being and health conditions. This is by participating actively in prescribed measures for health promotion, disease prevention, adherence to treatment and management of chronic conditions. In other words, citizens are empowered to support from their side the sustainability of health and social care systems. Secondly, citizens empowered in the way described above, can become a valuable "human resource" to health and social care systems. This is crucial considering the various issues regarding the workforce in health and social care, which have been identified for many years 155 such as: challenges related to recruitment and retention of health and social care professionals, adverse demographic trends in workforce, difficult working conditions, lack of career perspectives for low-skilled health and social care staff, as well as the need for new skills in digital technologies and new roles in reformed care models. Finally, citizens can also help improve the quality of care, by having the possibility to provide healthcare professionals with feedback and health data related to their treatment or health condition. Such data, typically referred to as patient-reported experiences (PREMs) and patient-reported outcomes (PROMs) are of great relevance to patient-centred care and can present decision-makers with evidence to help them improve health outcomes and allocate resources more efficiently. An example can be found at the Martini Klinik in Germany, which specialises in prostatectomy and focuses on outcomes that matter to patients, not only to mortality reduction. The achieved results present a large improvement in patient-reported outcomes when compared to other hospitals in Germany; namely in cases of severe erectile dysfunction and incontinence 156 . The EU Expert Group on Health Systems Performance Assessment has recommended that greater attention should be given to the assessment of patient experiences such as PREMs and PROMs 157 . The Active and Assisted Living Joint Programme 158 also provides important indicators to demonstrate the general benefit of involving users to meet real end-user needs and priorities in the innovation design processes, from idea creation to product testing and business model development 159 . The projects in this programme adopt a multidisciplinary approach, including the close involvement of end-users at all stages of new solutions and product design. Users account for an average of 18% of project participants. This active user involvement determines actual user needs instead of merely guessing or generalising what makes the difference between a real innovation for users or a simply interesting technical development. It also lowers the barriers for large-scale deployment of ICT-based solutions. As indicated above, the digital transformation and new care models require health and care professionals to develop new skills and competences in a range of aspects: using digital technologies, devices and data; new roles, knowledge and techniques to support patients with multiple chronic conditions and to allow better health promotion and disease prevention; working in multi- and inter-disciplinary teams; and new ways of working to provide care at a distance. Without these, health system transformations, such as the one to digitally-supported person-centred care, are at risk due to resulting skills mismatches of health and care professionals. Equally important is the need for citizens and patients to improve their health and digital literacy in order to assume greater responsibility for their health and engage in self-care. There is a growing body of evidence to support arguments that digital solutions can bring better health and care outcomes for citizens and contribute to improving the effectiveness, accessibility and resilience of health and care systems 160 , when designed purposefully with the involvement of users and implemented on the basis of cost-effective criteria. ·Health information portals, smartphones and mHealth apps empower citizens to take a more active role in looking after their health, change their health behaviours (within supportive environments) and engage in primary disease prevention. ·Digitally connected portable devices, sensors and apps can support patients in their adherence to treatments, managing their chronic conditions at their own home, and providing health data to their healthcare professionals as well as feedback on the quality of the health and care they receive. ·Electronic health records and telemedicine can facilitate the working conditions and the collaboration among health and social care professionals in delivery of integrated care services, also outside hospital settings, and can improve patient management as well as access of citizens to healthcare by overcoming geographical distances. Patient and user-generated health and care data are expected to further proliferate in the coming decade, creating continuously evolving and learning health systems 161 . This could potentially disrupt the established status quo of health and social care delivery, opening up the ability to deliver more targeted health and social care services to citizens, and unlocking opportunities for new, data-driven economic models in public and consumer markets 162 . Patient-reported outcomes have proven 163 most effective if collected and processed through digital means. Advantages include simple and reliable data storage, enhanced mechanisms to improve completion by patients (as compared to non-digital PROMs) and better accessibility through customised interfaces. However, more effort is needed 164 to reach the necessary scale at which one can make full use of the valuable information generated by patient-reported outcomes: this includes infrastructure, training of staff, demonstration of benefits and engagement of citizens. To realise the potential of digital solutions to facilitate access to healthcare in a fair and inclusive way, the eHealth Stakeholder Group has made a number of recommendations regarding "Health inequalities and eHealth" 165 including: improving access to eHealth and involving all stakeholders; accommodating diverse needs; improving digital health literacy; integrating eHealth into the overall health and social care system policy; evaluating the impact of eHealth solutions and building up an evidence base; giving specific consideration to empowering patients with disabilities or specific diseases; and considering financial subsidies for the purchase of eHealth equipment / ICT access. The literature on the impact of telehealth solutions for chronic conditions suggests that telehealth can reduce hospital admissions and mortality for chronic heart failure patients, improve blood pressure control in patients with hypertension, reduce hospital admissions for chronic obstructive pulmonary disease and improve glycaemic control in diabetes 166 , 167 , 168 , 169 . §The home telehealth services of the Veterans Health Administration in the USA have achieved lower patient mortality, 59% reduction of bed days of care, 35% reduction in hospital admissions and savings of USD 1,999 per patient per year 170 . §The Telecare Development Programme in Scotland brought efficiency gains of approximately GBP 78.6 million over a five year period (2006-2011) thanks to expedited hospital discharges, avoided hospital and care home admissions and bed days, and reduced home check visits 171 . §In the German region of Kinzigtal, an integrated care programme making use of ICT solutions has led to lower mortality and increased life expectancy of enrolled patients, morbidity-adjusted efficiency gain of 16% of the total costs, and reduction of 16.9% in per-capita expenditure of enrolled policy holders versus those in the control group over the period 2005-2010. Data from eight years of activity (2006-2014) has shown close to 3% net annual saving for the health insurance funds, considering all policy holders in Kinzigtal, whether enrolled in the integrated care programme or not 172 . A common element in these examples is that the evidence of cost-effectiveness became clear after the accumulation of data from thousands of patients over years of operations. This reinforces the argument that the return on investment will not appear immediately and that a systematic approach to evaluation is required, which relies on evidence from a large number of patients receiving actual services rather than on short-duration project trials. Another observation is that it matters greatly how a new care model using digital tools is designed and implemented to fit the local context and user needs. In other words, "how" a care model with a digital solution is implemented determines its success or failure. This emphasises the importance of spreading knowledge and building stakeholder's capacity on "how" to implement successfully. Several initiatives across Europe have promoted collaboration of a wide range of stakeholders in developing, testing and replicating innovative approaches to health and care services, in the field of disease prevention, integrated care and new ways for managing non-communicable diseases and co-morbidities, often with the use of digital solutions such as telehealth and mHealth. The European Innovation Partnership on Active and Healthy Ageing (EIP on AHA) 173 , the Active and Assisted Living Joint Programme (AAL) 174 , the EIT Health 175 , and the Joint Action CHRODIS 176 are such examples of transnational, inter-regional and inter-sectoral collaborations. These have been brought to light good practices, produced tools and guidance and have been supporting mutual learning and knowledge exchange with the purpose of facilitating the deployment of innovative solutions for health and care 177 . There is a growing observation of low scalability of digital health and care approaches from pilots to large-scale deployment and widespread uptake. Despite the recognised potential of integrated, person-centred care models and the digital transformation of health and care provision, benefits have not come to fruition in many cases as initiatives remain at project stage and do not permeate health and care provision at scale. Implementing such innovations at large scale, to offer services to all citizens who can benefit from them, is a major challenge. Most stakeholders acknowledge that technology itself is no longer the problem in this regard. Instead, organisational and financing issues (such as commitment from authorities, the need to re-configure services, new patient pathway designs, new roles and skills for health and social care professionals, interoperability, privacy and data protection, sustained investments and new governance, contracting and payment schemes) as well as the diversity of European health and care systems and the associated market fragmentation for technology providers constitute important obstacles and prevent statistically sound evaluation 178 . Example: Pilots and the "Valley of Death"
The EU project FICHe (2013-2016) challenged European SMEs to develop applications using Future Internet technology (FIWARE) for the Health market. The project followed a funnel approach: from 308 entries, 80 were selected to propose a Business Plan. Out of them, 40 were asked to prepare a Concept. Finally, only 20 received support to test a Pilot in collaboration with customers in one of the three regional field labs located in Spain, Finland and the Netherlands. Seven companies tested their solutions in the same number of hospital departments belonging to the Regional Healthcare Provider of Murcia (Spain). Out of the pilots, five turned out to deliver quite positive results for both the companies and the healthcare organisation. However, once the funding was over, this Healthcare organisation has been struggling to scale the successful pilots into wide adoption. There is currently no culture, governance or incentives to internally scale the solutions, which likely result in the non-adoption of the innovations in the near future. For this reason, EU added-value is expected to be high for potential candidates for scaling-up or knowledge sharing, since few regions have so far built up such a framework. Experience sharing could be particularly valuable for less advanced regions, not as a specific benefit on a specific topic, but rather as a more general strategic approach. In the UK, the "Whole System Demonstrator" programme provided positive evidence of the use of telehealth and telecare, for instance a significant reduction in mortality rates for chronic conditions 179 . In addition, the Department of Health estimated potential savings of GBP 1.2 billion through telecare and telehealth over five years. The Department launched the "3 Million Lives" campaign which aimed to encourage industry to develop new business models, to emphasise patient education and to support health and social care professionals in implementing telehealth and telecare. However, the campaign failed to reach the desired impact on deployment. According to a paper 180 prepared for the National Assembly of Wales Health and Care Committee, among the reasons was the approach taken, as it was perceived too top-down and industry-led, and that improvements were not entirely attributable to technology. Practitioners and users/patients were not sufficiently involved. A longitudinal qualitative analysis of a GBP 37 million national health programme ("Delivering Assisted Living Lifestyles at Scale", DALLAS) identified barriers and facilitators for the implementation of digital health at scale (see recommendations 181 ). oKey barriers to innovation scaling-up initiatives: (1) financial dimensions and access to EU funding opportunities; (2) institutional capacities related to the knowledge exchange itself; (3) human factors proving to be determinant in the level of acceptance and implementation of shared practices. oKey success factors: (1) clear vision, strong political commitment and clear identification of the benefit for each party involved; (2) identifying and analysing the current state of research and a clear awareness of research outcomes for actual capacity for fruitful knowledge exchange; (3) ensuring user acceptance (of patients and health and social care professionals) mainly based on actual skills and capacity to use the IT concepts and tools – the capacity of making the best use of innovation at individual level will then support long-term ownership and acceptance by users. EU-supported projects implemented in the Basque Country in Spain proved to be successful in redesigning delivery patterns and improving both patient experience and cost-efficiency. A prerequisite to be highlighted for this is the long-term political commitment of the authorities, embedded in a synergised and comprehensive policy agenda. The Basque authorities, made the best use of the EU projects to cover strategic steps of healthcare pathways in a synergetic way: population stratification (ASSEHS project), telehealth technologies for patients with chronic conditions (United4Health project), management of patients with complex health and social needs (Care Well project) or with mental disorders (Master Mind project). The supportive role of this overarching strategy in a context of innovative practices and knowledge sharing has been clearly identified as a key success factor of all EU projects. Similarly, the report of the Expert Group on Health Systems Performance Assessment 183 highlighted a number of principles and factors which are important for the successful implementation of integrated care: (1) political support and commitment; (2) governance; (3) stakeholder engagement; (4) organisational change; (5) leadership; (6) collaboration and trust; (7) workforce education and training; (8) patient focus/empowerment; (9) financing and incentives; (10) ICT infrastructure and solutions; and (11) monitoring/evaluation system. With regard to successful implementation of good practices for reducing the burden of chronic conditions, thoughtful design and good governance, adequate investment, empowering the target population, and educating and training care professionals are among the 12 main elements identified by the Joint Action CHRODIS 184 . On the specific points mentioned above, the EU added value is very important, considering the capacity developed at EU level in the field of experience sharing and benchmarking. Expanding a business beyond the realm of its home market is usually taking a plunge into the near-unknown. There are still many barriers that need to be overcome when breaking into and expanding sales in different European markets. These barriers include cultural diversity, language, market size and geographic location. There is no single European healthcare system or market like in the United States where there is a much more homogenous market. The project APOLLON ( http://cordis.europa.eu/project/rcn/191724_en.html ), funded under the Competitiveness and Innovation Framework Programme , demonstrated that for SMEs cross-border pilots forced them to re-think the initial business case into a European context. This increased the development process for building the right proposition and a better product fit, which had a huge impact - in a positive way - on how they are developing and deploying the product/service. Cross-border exchanges gave SMEs the opportunity to discuss the healthcare ecosystem in other countries. This enabled them not only to identify different needs and possible enhancements to their products but also to explore new (business) opportunities and gave insights into the requirements and operational issues related to transferring products to other markets outside the base market. The Active and Assisted Living Joint Programme has been operational since 2008 and provided support to more than 300 SMEs in bringing new products and services to the market by lowering the barriers for access to EU level cooperation through the joint efforts from the Member States and the EU. In addition it has allowed Member States to add value to their related national activities by providing an easy framework for EU level cooperation. In the health domain, an additional hurdle is the fact that healthcare systems represent complex value networks involving governments, care providers, insurance payers, patients and citizens and also tend to differ from one country to another. Introduction of new solutions is difficult and small and medium-sized enterprises (SMEs), in particular, struggle to access new markets and new ecosystems. This is mainly because of a lack of knowledge and experience related to these new markets, and because of a (perceived or real) lack of budget and time to overcome the costs associated with entering into new partnerships and markets. The argument in favour of consumer-friendly apps and other eHealth services is also challenged by the fact that there is still little robust proof of the value of such solutions. More research and new evaluation approaches are needed, in line with the messages in section 4.2.1, to qualify and quantify the benefits of digital health technologies when it comes to cost-effectiveness, value calculations and user experience. For a more systematic recommendation and use of digital tools in healthcare practice, healthcare professionals need greater confidence in them as well as stronger clinical evidence of their value. On the whole, physicians are wary of formally recommending apps or electronic devices to patients without robust evidence of their benefit, guidelines for their use or assurance that the patient’s personal information will remain secure. Insurers and employer health programmes also want clear evidence of benefit before considering reimbursement or promoting the use of digital tools. Health authorities have started to respond to this need 185 . The validity and reliability of data from digital health solutions is a major concern as confirmed by the Open Public Consultation held in preparation of the Commission Communication on Transformation of Health and Care in the Digital Single Market. It remains an important topic in European Commission policy. Digital health solutions which are intended to be used for a specific medical purpose may be regulated as medical devices and therefore subject to the stringent safety and performance requirements of the EU medical device legal framework. The new Regulation on medical devices, which will become applicable as from May 2020, reinforces requirements on clinical data for devices and, in the case of software and apps, foresees new dedicated classification rules which, in many cases, will determine an upgrade of their risk class and a more stringent conformity assessment prior to certification. In addition to that, more specific safety and performance requirements for medical software and apps are therein laid down. Digital solutions which are not medical devices are not covered by any specific legislation and rules for their certification might well vary across different EU Member States. With respect to this latter category, in 2016 the European Commission established a Working Group on mHealth assessment guidelines. The mandate of the group was "to develop guidelines for assessing the validity and reliability of the data that health apps collect and process". The Working Group reported in June 2017 186 that a considerable amount of work was put into this objective of issuing guidelines but it appeared that building these guidelines was a much more complex exercise than expected at the beginning of the process, and that the work to be done goes beyond the original mandate of the Working Group. The experience of different stakeholders collected and documented by the Working Group is a useful basis for the future actions, notably by the eHealth Network and the mHealth Hub, a very recently launched project funded by the Horizon 2020 programme. The Commission has also verified that, in light of the fact that most healthcare professionals and healthcare institutions make use of apps which are certified as medical devices, any further initiative from the Commission to tackle market fragmentation in this specific field should address the full range of mHealth apps, while remaining fully compatible with the medical device legal framework. From a commercial point of view, another key challenge recognised is the difficulty of operators to identify the legal framework which is applicable to their product, as the borderline area between digital health solutions which are medical devices and those which are not is a complex one, involving in many cases very technical analysis and considerations. This is an area where certain stakeholders expressed calls upon the Commission to develop concrete instruments to provide economic operators with the necessary guidance. A series of workshops in 2016 resulted 187 in a common commitment to building a European Reference Framework as a basis for informed investment decisions in retrofitting and building housing suitable and adaptable to technology-supported age-friendly independent living. This nascent framework 188 , in the same way as the guidelines on mHealth solutions, is expected to provide common visions and decision support in order to inform investment decisions (both public and private) and policy on housing stock suitable for the demands of an ageing society. The global entrepreneurship organisation Mind the Bridge estimates that there are approximately 4,200 fast growing, high-tech companies in Europe called "scale-ups". The term scale-up distinguishes companies from early-stage start-ups, which are still struggling with initial challenges to build their business models and find investment. Scale-ups have overcome this phase, are executing their business models, have found investment, are producing revenues, and are growing in terms of market access, number of employees and revenue through relationships with established companies and investors 189 . According to a recent report "On the Rise: An Analysis of 1000+ European Scale-ups" of Tech.eu 190 the first half of 2017 has been especially strong for scale-ups in Europe, with EUR 9 billion already raised in 409 deals, compared to just EUR 12.2 billion raised in the whole of 2016. Fintech (the use of technology in the financial services sector) is the strongest vertical sector for scale-ups, followed by the medical/healthcare sector and transportation. The recent European Health Tech Report 2016 191 states that HealthTech 192 is at the forefront of start-ups and scale-ups, in the United States as well as in Europe. This report highlights that in 2016 HealthTech is the second most funded industry in number of deals and that 64% of European HealthTech scale-ups are business-to-business (B2B) oriented. In average, 13 HealthTech deals of at least EUR 750 000 are closed in Europe every month and the European HealthTech scale-ups together raised EUR 1.094 billion in 2016 or on average EUR 90 million per month. However, compared to the USD 4.2 billion in the USA 193 , Europe is still lagging behind to un-tapping the huge market potential of the digital health market. The report also shows that it takes in average five years for HealthTech companies to raise substantial external financing. In most EU countries digital health incubators stimulate the local start-up ecosystem and investments quite well, but support for taking the start-ups to the scale-up phase is less elaborated. These time cycles need to be shortened and investment instruments streamlined if leveraging the potential of European companies active in the digital health field is to be fully realised. Too often, European start-ups use the fact that they benefit from European SME-support as a label for getting access to second round financing in the USA and deploy their go-to-market phase in the USA instead of Europe. Start-up companies like the Belgian based Cubigo 194 realised a real break-through and recognition on the European market after being selected by Google BlackBox connected boot camp 195 in January 2015; and in April 2017 they announced EUR 4 million investment for international expansion. Also the Portuguese based start-up Sword Health 196 went to the USA for the market roll-out of its solution. The recently established Thematic Smart Specialisation Platforms (TSSP) 197 offer a new approach to help coordinate regional stakeholders and open the path to a stronger collaboration for both private and public investors. This can unlock, among others, the potential of synergies between European Structural and Investment Funds (ESIF) and the European Fund for Strategic Investments (EFSI) for the healthcare sector 198 . In this regard, the TSSP partnership on Medical Technology, led by the French region Auvergne-Rhône-Alpes and composed by stakeholders of 15 EU regions, addresses the key challenge of digitalising the economy of the healthcare sector while limiting its costs for both citizens and service providers (e.g. public hospitals). According to a recent WHO report, the lack of funding is one of the most significant barriers to the deployment of digital solutions in health 199 . The same holds true for the implementation of new care models in the context of health system reforms. Up-front investment is typically required to cover the set-up costs and the costs of transition to a new care model such as integrated care: costs for buildings, facilities and ICT; costs for human resources, training/development and continuous technical support; costs of implementing innovations and organisational changes etc. Furthermore, the investment needs to be sustained during a transitional period until the new care model achieves beneficial outcomes and realises efficiencies. The return on investment may thus only come in medium-long term and, consequently, investments in new care models, which may also employ digital solutions, are considered to be of high risk. From the above, it is also clear that investing into a new care model entails investments in a range of areas and elements. Several potential sources of finance may be considered and deemed available, for instance: national and regional innovation funds, European funds, private Venture Capital and Business Angels funds, insurance and pension funds, loan facilities from banks, charitable and philanthropy bonds, crowd funding etc. However, due to specialisation of most funds, few financing schemes - if any at all - are investing in all the elements needed to implement a new care model at scale. In February 2017, the European Commission, in cooperation with the European Investment Bank, organised a seminar to discuss these challenges around investments for innovative forms of healthcare 200 . One of the main messages from the seminar is that long-term thinking together with a reform plan and an investment strategy are required to deliver transformed health services. An integrated investment approach should be pursued, which considers the overall needs for (i) infrastructure, (ii) technologies and (iii) service models together, and also aims at accessing and blending financing from different sources in a strategic way. In this context, it is important for health authorities to raise their capacities to manage new financial instruments. A broad range of public and private partners and investors need to engage and work together. Investment strategies need to be underpinned by new contracting and payment schemes, which encourage all partners to jointly design, finance and deliver new care models for transformed health services. Partnerships among purchasers and providers of care services form a fundamental element in this regard. Various partnership schemes are possible (e.g., lead contractor, alliance contracts, integrated providers, accountable care organisations, etc.) with differing approaches to contractual and governance aspects and the degree of sharing risks, assets and rewards among partners. Similarly, various payment models may be considered such as pay-for-performance, bundled payments, shared savings schemes and population-based payments (in the form of capitation or global budgets) 201 , 202 . There is no "one size fits all"; instead it is crucial to consider the local context where services will be delivered. Long-term approaches are particularly helpful in providing certainty until the anticipated benefits from new care models and the return-on-investment materialise. While there are numerous examples of proven digital innovations across Europe, most of them remain on a small scale and fail to scale-up, despite the recognised benefits they could bring to citizens and society. The preceding sections indicated a number of reasons, which have been manifesting as critical aspects and gaps in implementation capacity for a number of years: market fragmentation, lack of investments, re-organising the models of care and generating robust evidence. These highlight the fact that digital tools are only a component of a care model and that the potential benefits from using digital tools will not materialise before care authorities succeed in developing further their capabilities to implement person-centred care models at scale. The WHO report "From Innovation to Implementation. eHealth in the WHO European Region" emphasises the need for Member States to build capacity for implementing and managing eHealth solutions. a)Support to the supply side of digital health in Europe using existing knowledge in Member States and regions. b)Providing assistance to national and regional care authorities to build their know-how and capacity to implement successfully digitally-supported, integrated, person-centred care at scale, as part of their health system reforms. c)Mobilising investments for large scale implementation. Further action at EU level might help address the issue of critical mass both from the demand and supply points of view. Building on existing EU-level cooperation, such as in the European Innovation Partnership on Active and Healthy Ageing, Active and Assisted Living Joint Programme, EIT Health and Joint Actions of the Health Programme, further collaboration at EU level could strengthen mutual learning, knowledge sharing and transfer among care authorities and help those who wish to ease their path to large scale adoption of digital health innovations. Joint action can also boost the possibilities for economies of scale for technology and service suppliers and reduce the risk of fragmentation in care delivery for citizens. Collaboration, exchange of expertise and the creation of scalable markets at EU level can facilitate the formation of stakeholder ecosystems for building strong investment propositions and for creating better conditions to implement reforms in health and care. In Estonia, investments from the European Structural and Investment Funds (EUR 85 million, plus co-financing from the government) are directed at building a network of primary care health centres that will employ multi-professional teams (General Practitioners, nurses, midwives and physiotherapists), with coordinated access to hospital specialist care. In a future phase, social care services and mental health services for children are considered too. The investment plan was approved in August 2016 and foresees development of 59 primary care health centres between 2018 and 2023. The Investment Plan for Europe, through its European Fund for Strategic Investments (EFSI), is backing Ireland's health reform strategy. In May 2016, the European Investment Bank granted a 25-year loan of EUR 70 million EFSI financing for the construction of 14 new primary healthcare centres across Ireland over a two-year period. This is part of a larger investment of EUR 135 million, with the additional financing coming from a Public-Private Partnership (PPP) consortium. The construction of these primary care centres is part of a national strategy to shift care to community level, bringing together General Practitioners, nurses, occupational therapists, social workers and other specialists to provide a range of integrated care services in the community. The shift to new models of care can be supported by increased awareness amongst healthcare stakeholders of financing opportunities at European, national and regional level, stronger collaboration of public and private investors, as well as financial brokerage/technical assistance services. Making a more complementary use of European funds - for example the European Structural and Investment Funds and the European Fund for Strategic Investments 203 - to trigger further investment in the integration of health and care can be one path towards the realisation of these opportunities. The examples of Primary Care Centres in Ireland 204 and Estonia (see box below), demonstrate how the infrastructural needs for the transition to new care models can be met with a combination of European financing, national funding and private co-financing. A number of studies point out that enabling the digital single market for health and care solutions would create pan-European business opportunities, including for innovative start-ups and SMEs 205 . The global market for mobile health is growing fast and is expected to be worth USD 23 billion in 2017 206 . In Europe, the scaling up of mobile health technology able to support self-management of health and wellbeing could potentially generate important savings by boosting prevention. The estimated annual savings amount to EUR 69 billion 207 . Although there is a recognition that mHealth can support better health and care provision to citizens, the emergence and widespread use of mHealth applications also raises new questions concerning the regulatory frameworks that apply to the validity and use of data generated by mHealth applications and the security of EU citizens making use of those apps. Addressing the non-communicable diseases epidemic, EU level action should be ambitious and include a clear focus on social and technological innovation 208 . The transfer of good practices across EU Member States and regional health and care authorities could be more actively supported, in order to jointly address barriers to the uptake of such practices, reach implementation at large scale and facilitate cross-border actions on digital health programmes to tackle non-communicable diseases - including the development of quality control instruments based on feedback systems between users and healthcare providers. There are currently large variations across Europe in the capacity of countries to absorb digital health and care innovations. The following graph shows the differences between selected European countries in markets for digital health and care 209 . In the context of the Digital Single Market, it is critical to work towards the capacity of all Member States and regions to create value through novel approaches to health and care delivery. This can also be an opportunity to tackle differences in the effectiveness of the market for digital health and care provision. Expenditure and spending patterns as indicators vary greatly across Europe. For example, Eurostat data shows large differences in long-term care expenditure in Member States, between 4.0% of GDP in Finland and 0.01% in Bulgaria 210 . While there is no linear relationship between healthcare expenditure and achieved health outcomes, and digital transformation does not intend to close gaps in healthcare spending, digital solutions can help health and social care systems achieve more with the resources available. Numerous stakeholders point out that insufficient EU-level coordination could mean that efficiencies, which can be generated by innovative digital solutions and care models, would remain slow, small-scale and limited to a particular region or Member State, further accentuating health market inequalities between Member States. In this context, it is often underlined that swift deployment at large-scale of digital solutions and new care models can best be achieved by working together at EU level, sharing experiences in deploying, measuring impact and transferring innovation across several EU Member States and regions 211 . Hence, it is widely recognised that coordinated innovation support should aim to ensure that the benefits of innovation can be exploited across Europe and that the single market creates the conditions for wider absorption of innovation capacity. Such coordinated efforts in deploying value-oriented innovation in health and care are demonstrated, for instance, in the joint procurement of innovation by the RITMOCORE 212 consortium. The EU co-funded cooperation between partners from Spain, the United Kingdom, the Netherlands and Italy will procure remote support centres for monitoring and data flow (from pacemakers and other devices), using apps and multi-channel communication for patient activation. The project puts emphasis on cost-effectiveness, patients' wellbeing and growth and innovation effects. To evaluate these, it applies a common approach using the Monitoring and Assessment Framework for the EIP on Active and Healthy Ageing 213 . An important outcome with European added value is the evaluation of the new procurement approach itself with its ambition to scale beyond individual cases. With an average age of 44 years, Europe will be the ‘oldest’ region by 2030 — more than double the average age of 21 in Sub-Saharan Africa. People over 65 will account for close to 23 % of the European Union’s population, compared with 16 % today (Rand Europe report to ESPAS 2013). "We must urgently clarify data-sharing rules" (Nature 541, 437 (26 January 2017) ( https://www.nature.com/news/we-must-urgently-clarify-data-sharing-rules-1.21350 ). Regulation (EU) No 1291/2013 of the European Parliament and of the Council of 11 December 2013 establishing Horizon 2020OJ L347, 20.12.2013, p.1 In total, H2020 Societal Challenge 1 includes approximately EUR 1 billion funding to support research and innovation in digital health and care. This includes for example, the Active and Assisted Living Joint Programme that has leveraged funding from 28 European countries to support more than 300 SMEs in going to the market with digitally based products and services in support of active and healthy ageing. The European Innovation Partnership on Active and Healthy Ageing activities, supported by several large-scale pilots funded under FP7 and H2020, aims to implement integrated care programmes across European regions. The eHealth Network has adopted guidelines on the minimum patient summary datasets for electronic exchange and on ePrescriptions. The telecommunications sector of the Connecting Europe Facility is financing an EU digital infrastructure for eHealth with 16 Member States to build up concrete capacity to exchange health data. The Commission, with the endorsement of the eHealth Network, proposed the Refined Health Interoperability Framework based on the results of studies, pilots and research projects. On 28 July 2015 the Commission has adopted the Decision on the identification of ‘Integrating the Healthcare Enterprise’ profiles for referencing in public procurement. European Hospital Survey – Benchmarking Deployment of eHealth Services 2012-2013 (PwC) https://ec.europa.eu/digital-single-market/en/news/european-hospital-survey-benchmarking-deployment-ehealth-services-2012-2013. For example mobile health technology, wellness wearables and applications, remote monitoring, connected care at home, telemonitoring, telehealth and telecare solutions that can be delivered cross-border. Globally, Europe has the highest burden of non-communicable diseases which are responsible for 86 % of all deaths. The World Health Organisation considers the rise in non-communicable diseases an epidemic and estimates that this will claim the lives of 52 million people in the European Region by 2030. Non-communicable diseases affect more than 80% of people over 65 in Europe. Amongst the different non-communicable diseases, mental health is a real public health challenge; an estimated 18.7 million EU citizens are expected to suffer from dementia by 2050. ICT-enabled platforms that provide guidance and advice on lifestyle behaviours (physical activity, nutrition etc. ), allow citizens to access and maintain a repository of data concerning their health (medical exams, consultation records etc. ), and in some cases enable the user to produce feedback on health and care services. Overview of National Laws on Electronic Health Records in the EU Member States and their interaction with the provision of cross-border eHealth services, July 2014 (Milieu Ltd). Article 89 of the GDPR allows Member States to further specify in national law safeguards and derogations relating to processing for archiving purposes in the public interest, scientific or historical research purposes or statistical purposes. European Patients' Forum – Data Protection Regulation November 2012.
de Lusignan S, Mold F, Sheikh A, Majeed A, Wyatt JC, Quinn T, et al. (2014). Patients' online access to their electronic health records and linked online services: a systematic interpretative review. BMJ Open, 4(9). http://dx.doi.org/10.1136/bmjopen-2014-006021 . Evaluate openEHR Standards for Managing Clinical Content Across the Care Continuum, April 2017, Gartner Inc.
Gartner survey of EHR suppliers and systems in the Norwegian market, September 2014, Gartner Inc. The Health Information Technology for Economic and Clinical Health Act (HITECH Act) legislation was created in 2009 to stimulate the adoption of electronic health records and supporting technology in the United States. The US Executive Order 13335 from 2004 on Incentives for the Use of Health Information Technology and Establishing the Position of the National Health Information Technology. Fragidis, L. L. and Chatzoglou, D. P. (2017). Development of Nationwide Electronic Health Record (ΝEHR): An international survey. Health Policy and Technology, Vol 6, pp. 124–133. The Commonwealth of Independent States (CIS) includes Armenia, Azerbaijan, Belarus, Kazakhstan, Kyrgyzstan, the Republic of Moldova, the Russian Federation, Tajikistan and Uzbekistan; Turkmenistan and Ukraine are included as Associate States. * Belarus is not included in this analysis. The Central Asian Republics Health Information Network (CARINFONET) consists of Kazakhstan, Kyrgyzstan, Tajikistan, Turkmenistan and Uzbekistan. South-eastern Europe Health Network (SEEHN) consists of Albania, Bosnia and Herzegovina, Bulgaria, Croatia, Israel, Montenegro, the Republic of Moldova, Romania, Serbia and the former Yugoslav Republic of Macedonia. * The former Yugoslav Republic of Macedonia is not included in this analysis. Small countries consist of Andorra, Cyprus, Luxembourg, Iceland, Malta, Monaco, Montenegro and San Marino. * Andorra and Monaco are not included in this analysis. The Nordic countries are Denmark, Finland, Iceland, Norway and Sweden. Overview of the national laws on electronic health records in the EU Member States and their interaction with the provision of cross-border eHealth services, July 2014 (Milieu Ltd). Directive 2011/24/EU on the application of patients’ rights clarified the legal framework for patients to be reimbursed for cross-border healthcare. Firstly, it established the principle that a telemedicine service is considered to be provided in the Member State where the service provider is established. Secondly, the e-Health Network established cooperation between Member State health systems. The Network has adopted guidelines on patient summaries and e-prescriptions, and is working on the use of health data for public health and research. The IT system supporting the exchange of patient summaries and e-prescriptions is being built with funding from the Connecting Europe Facility. Tora Hammar, Sofie Nyström, Göran Petersson, Tony Rydberg, and Bengt Åstrand, “Swedish Pharmacists Value E-Prescribing: a Survey of a Nationwide Implementation,” Journal of Pharmaceutical Health Services Research, Vol. 1, No. 1 (March 2010). Health Information and Quality Authority (HIQA), “E-Prescribing and Electronic Transfer of Prescriptions: An International Review,” Report, December 2012. Cross-border health care in Europe by Katharine Footman, Cécile Knai, Rita Baeten, Ketevan Glonti, Martin McKee (World Health Organization 2014). For example, Techniker Krankenkasse surveying 45,000 German insurants who had received services abroad in 2010. The company found that 37% of insurants required follow-up treatment after receiving care abroad, which was mostly provided by a German physician at home (92%). But communication between the physician abroad and the patient’s physician at home was rare (15%). European Commission - European Core Health Indicators (ECHI) based on the Percentage of non-resident people among all people being discharged from hospital. Auffray, C. et al. (2016). Making sense of big data in health research: Towards an EU action plan. Genome Medicine 8:71. Kierkegaard, Patrick. (2011). Electronic Health Record: Wiring Europe’s Healthcare. Computer Law & Security Report. 27. 503-515. 10.1016/j.clsr.2011.07.013. Personalised medicine has been referred to as a medical model using characterisation of individuals' phenotypes and genotypes (e.g. molecular profiling, diagnostic imaging, lifestyle data) for tailoring the right therapeutic strategy for the right person at the right time, and/or to determine the predisposition to disease and/or to deliver timely and targeted prevention. Personalised medicine relates to the broader concept of patient-centred care, which takes into account that, in general, healthcare systems need to better respond to patient needs. 2. Wood AR, Esko T, Yang J, Vedantam S, Pers TH, Gustafsson S, et al. Defining the role of common variation in the genomic and biological architecture of adult human height. Nat Genet. 2014;46:1173–86. 1. Ideker T, Dutkowski J, Hood L. Boosting signal-to-noise in complex biology: prior knowledge is power. Cell. 2011;144:860–3. The economic impact of the Human Genome Project in the USA has been calculated as $796 billion from a USD 3.8 billion investment. The consortium includes 22 EU Member States, including 9 of the EU13, five countries associated to Horizon 2020 and Canada as an international partner. It also includes a number of EU regions, which along with the involvement of Ministries for Health enforces both the link to the authorities responsible for delivery of healthcare and to the common funds for regional development. In the Smart Specialisation strategies for research and innovation (RIS3), approximately a third of the regions and countries identify personalised medicine as one of their thematic priorities. Of the 146 regions or countries having issued a strategy, at least 45 have identified personalised medicine a priority. As one of the vehicles for implementing the recommendations of the Action Plan, the Commission is co-funding an ERA-Net, called ERA-PerMed, which started in December 2017 and will issued its first call in early 2018. This ERA-Net has currently 31 participating funding organisations from around Europe and Canada, but is open to further extension. ERA-PerMed has a total investment projected to reach over EUR 30 million, of which the Commission contributes close to EUR 10 million, Among the areas to be funded by the ERA-Net are aspects related to data analysis, management and protection, corresponding to the challenge "integrating big data and ICT solutions". "WHO global strategy on people-centred and integrated health services", World Health Organisation, 2015. Examples can be found in the Reference Sites and the regions participating in the Action Groups of the European Innovation Partnership on Active and Healthy Ageing. Shah KN et al. Patient-Reported Outcome Measures: How Do Digital Tablets Stack Up to Paper Forms? A Randomized, Controlled Study, American Journal of Orthopedics 01 Nov 2016, 45(7):E451-E457, http://europepmc.org/abstract/med/28005113 . Inglis SC et al. Structured telephone support or non-invasive telemonitoring for patients with heart failure. Cochrane Database of Systematic Reviews 2015, Issue 10. Art. No. : CD007228. DOI: 10.1002/14651858.CD007228.pub3. Flodgren G et al. Interactive telemedicine: effects on professional practice and health care outcomes. Cochrane Database of Systematic Reviews 2015, Issue 9. Art. No. : CD002098. DOI:10.1002/14651858.CD002098.pub2. "TECS evidence base review. Findings and recommendations", NHS England, April 2017. Papadopoulos, H., Sheth, V.B., & Wurst, M. (2013). “Comparison of US and EU regulatory approaches to mobile health apps: Use cases of myVisionTrack and USEFIL.” European Journal of ePractice, 21. Tech.eu defines scale-ups as companies that have had an investment of at least EUR 5-20 million or a series B funding round, exist for 3 years or more and have not yet exited through an IPO (Initial Public Offering) or acquisition. "From Innovation to Implementation. eHealth in the WHO European Region", World Health Organisation, 2016. OECD (2016), Better Ways to Pay for Health Care, OECD Health Policy Studies, OECD Publishing, Paris. - Manyika, J. et al., Disruptive technologies: Advances that will transform life, business, and the global economy, McKinsey Global Institute, 2013 – estimates the potential economic impact of the Internet of Things across healthcare applications to be USD 1.1 trillion to USD 2.5 trillion per year by 2025. Emerging eHealth: Paths for growth (PwC and Economist Intelligence Unit 2014). Mobile health services include solutions for the patient (wellness, prevention, diagnosis, treatment and monitoring services) or healthcare system solutions (e.g. healthcare practitioner support, administration). Remote monitoring services and applications are expected to account for nearly 65%, corresponding to $15 billion by 2017. It is projected that the EU and Asia-Pacific will have the biggest market share of about 30% each, offering significant economic growth opportunities.